rays as they cascade over creation. Poise the camera - and begin painting with the light. My joy in watching and photographing birds, butterflies and wildlife that interact in this scenario knows no bounds. Witnessing the new beginning of each day is especially poignant when more of the years one has lived are now past than those remaining on the future tab. Knowing and accepting this reality tends to focus the mind. Ever aware of the devastating effects of human-made pollution contributing to climate change, we established our property as a legally protected environment for wildlife habitat, including bees, butterflies and other pollinators, as well as a myriad of other species, trees and plants that share our beautiful intact deciduous forest. From time to time, we work with wildlife experts, foresters, entomologists, and naturalists to encourage species and wildlife restoration. It is a work in progress. One day, much to my surprise, a bumble bee with large orange balls flew by. After a bit of school-yard snickering, my curiosity gave way to a flurry of research. 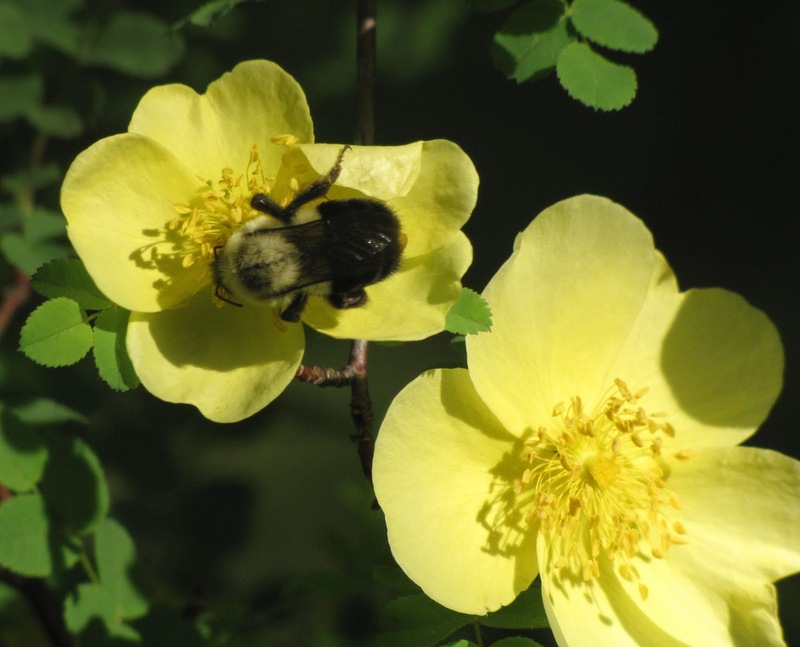 We all know that honey comes from bees gathering pollen and nectar from plants. But how do these little critters actually do what they do? To better understand, we need to take a closer look at those lovely, little bee legs, all three pairs of them. Imagine for a moment what it’s like to be a bee. So there you are, flying and hovering in mid-air, flitting about from flower to flower, dislodging and licking pollen off the anther of the flower. Sometimes you’re just 'rollin’ in the pollen' for the sheer joy of it all. You look down and realize you’ve got it all over yourself. If you’re a squash bee, you are also in a drunken stupor, having spent the night trapped inside the long pouch of the squash flower before making a slit and heading home to the hive. Moving the pollen to where it needs to be involves all three sets of bees legs. First, the bee removes wet pollen from its antenna, head and mouth using its forelegs. 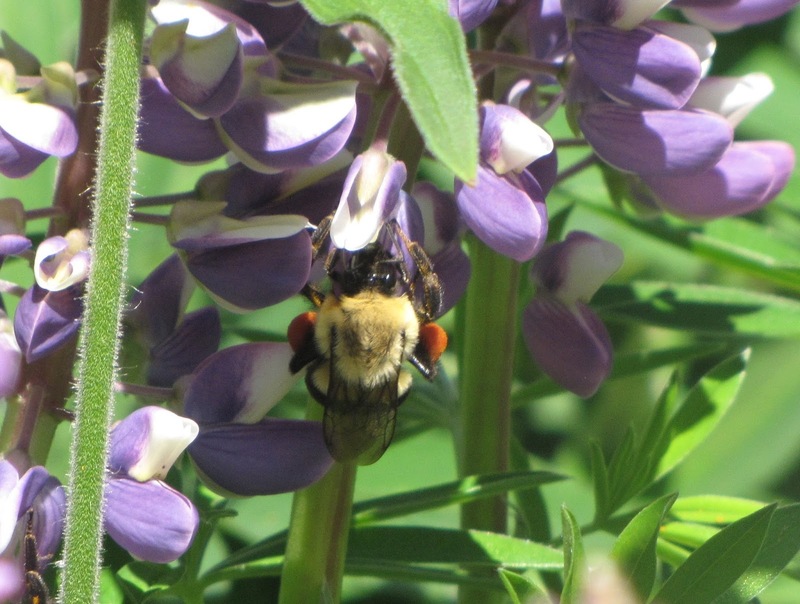 The forelegs then pass the pollen to the middle set of legs. These middle legs then comb more pollen from the underside of the bee's sweet wee chest, and add it to the batch accumulating. So far, so good? I think that the evolutionary 'pièce de résistance' is found in the design of the rear legs. The lower rear leg on a bee is called a tibia. Think of your calf. The bee’s tibia is flat, shiny, and somewhat convex and is surrounded by stiff hairs. This area forms a pollen basket. 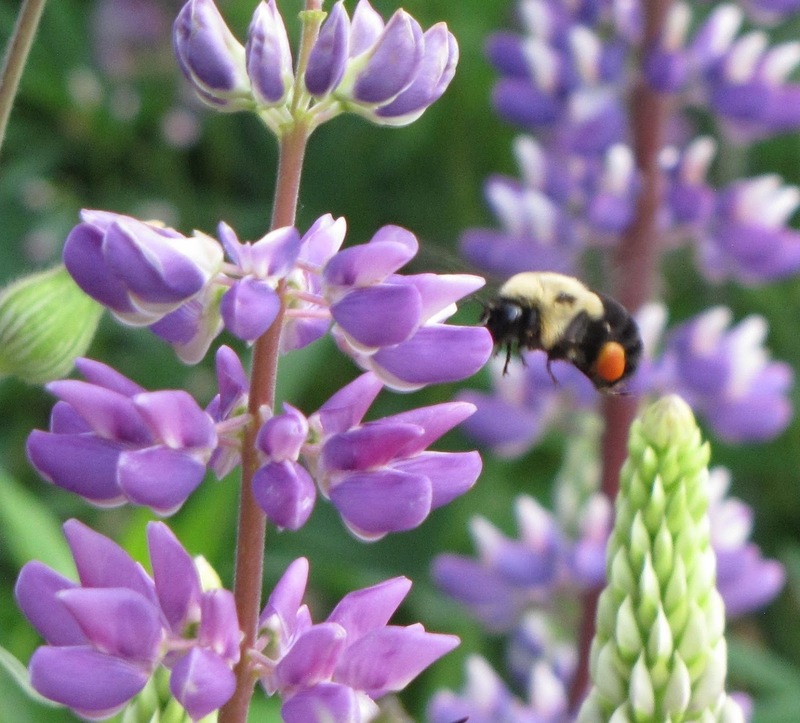 Workers and Queen bees have a pollen basked located on the outside of each rear leg. Next, on the lower end of the tibia is a comb-like structure. Think of your ankle - with a rake sticking out of it. Lastly, moving further down is the metatarsus, which is the press. Think of your heel - flattening things. The comb and this press work together, sort of like levers. The middle legs continue to pass the pollen down to the rear legs. The bee manipulates the comb and press levers by rubbing her hind legs together. The rake of the opposite leg forces the sticky pollen into the bottom part of the basket. As the bee continues to visit flowers, each new batch of pollen she gathers is pressed with the heel onto the bottom of the basket, pushing the previous batches further further up. 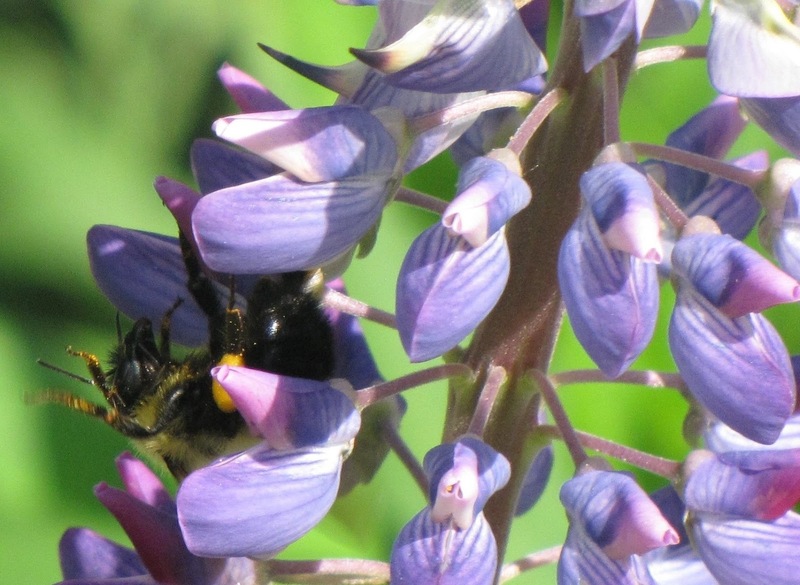 When the pollen basket is full, it will bulge with upwards of one million grains of pollen. Voila – the large, orange balls on my bumble bee are created. Mystery solved! Do you know it takes a honey bee about an hour to collect one pellet – which is about one full pollen basket? For even greater perspective, a teaspoon of bee pollen contains about 1200 of these pellets! Nutritionally-speaking, bee pollen is a complete protein and contains more protein proportionately than meat or fish. It also contains all 22 amino acids that the human body needs but cannot produce for itself. If consuming a bee pollen supplement, try to ponder the effort it took for bees to produce this amazing food. I would be remiss if I didn’t share another strange coincidence that happened during this journey of discovery. 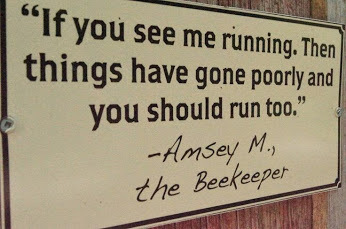 I was led … no … I stumbled into becoming a novice bee-keeper. Knowing my fascination with anything that flies, my good friends had given me a butterfly house. I painted it lilac and set it out in the garden by the pond. I would check and re-check it, but nary a cocoon did I find hibernating there in the first year. So early this spring, I decided to move it over a bit. I lifted the lid - and came face-to-buzz with the Queen bee and her minions. I don’t know who acted first or quickest, but I dropped the lid sideways and well … this well-known bee-keeper sign says it all. My butterfly house is now a hive full of happy bees. And how did I get that lid back on without annoying them further? Picture this. A no longer curious but rather terrified woman crawling on her stomach across the porch floor with long BBQ tongs in hand, reaching through the space between the wooden railings, and carefully nudging the edge of the lid back in place. I will consult with a local bee-keeper to prepare the hive for the coming winter. The odd person asks me from time-to-time if I ever get bored living in the country. When I have finished laughing, an insightful quotation comes to mind.